Has the summer stupor kicked in? Markets are looking weak Friday, and there are no U.S. World Cup matches to provide a distraction. "Today, I think I'd be surprised if we make a significant move one way or another," said Art Hogan, chief market strategist for Wunderlich Securities. "Although you're not seeing anybody panic over the market, you're not seeing anybody rush into it either." 1. Potential market movers -- Nike, GE: Shares in Nike (NKE) were rising by about 3% premarket after the company's earnings beat Wall Street's expectations. Barclays (BCS) shares were rising ahead of the bell, but falling far short of recouping their 7% dive from Thursday, following a lawsuit from the New York Attorney General over lack of transparency in so-called "dark pool" trading. General Electric (GE) was another premarket mover Friday, with shares down by about 1%. The company recently agreed to buy Alstom (ALSMY)'s power generation business. 2. Economic announcements: The University of Michigan will report its consumer sentiment index at 9:55 a.m. ET. 3. Calm before the weekend: U.S. stock futures were slightly lower ahead of the open, continuing the recent trend of modest moves. 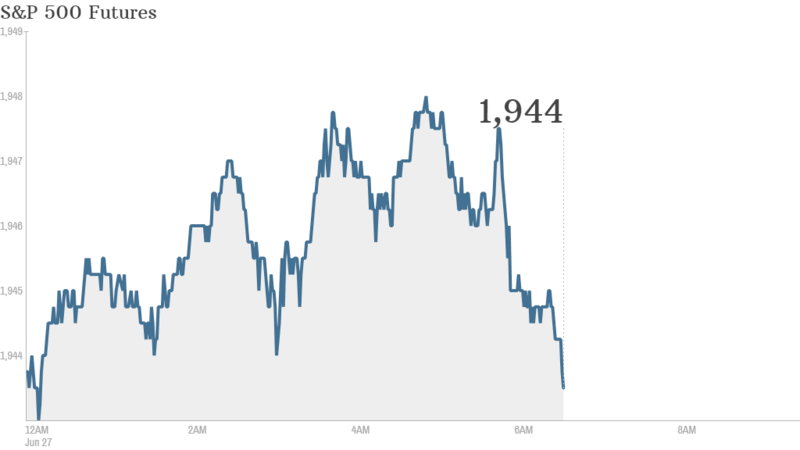 U.S. stocks closed slightly lower Thursday. The Dow Jones Industrial Average and S&P 500 ended the day in the red, while the Nasdaq finished flat. Oil and gold were little changed too. CNNMoney's Fear & Greed index shows investors are still feeling very greedy. 4. Mid-year report: So far this year, stock market performance has been impressive. After a significant drop in January, all three major U.S. indexes have gone on to new record highs. The S&P 500 has surged by nearly 6%, the Nasdaq is up by almost 5% and the Dow has risen by 1.6%. 5. International markets in positive territory: European markets were mixed in midday trading. In Asian markets, the Nikkei in Tokyo was a standout performer as it fell by 1.4% Friday. The other key indexes were mixed.